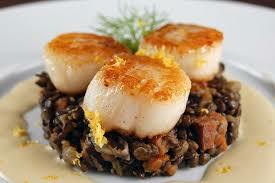 Pan fried scallops served with spycy lentils and creme fraiche. Escalope of turkey and parma ham coated with bread crumbs, topped with fried egg and served with linguine pesto. Homemade pancakes filled with pumpkin & ricotta baked with tomato sauce topped with mozzarella. Pandoro, berries and zabaglione triffle.